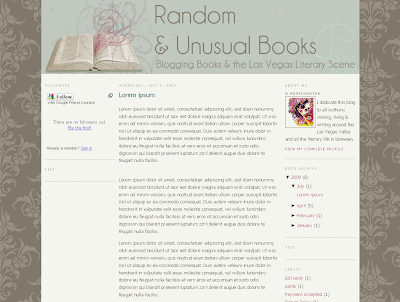 Nothing too jazzy, but another blogspot template I designed for my sister, "the book enthusiast." And as usual, she still is not ready for the site to be made public so I cannot share the URL right now, but that screen capture does enlarge if you're really bored and want to take a gander at it. Thank you so much :) I've really put a lot of work into this blog & am constantly trying to improve it :) Thinking about making templates for others to use when I get the time! that effect on the book is definitely cool. Thanks, the book effect was actually pretty simple, did a color overlay to give it the gold tint, then used a brush to make the swilrling dots. wow, that's a fast reply. I've just finished installing PS. total newbie. gonna try to do that effect first. @Pech :) yeah I happened to be online just after you posted your comment. And actually I made that in a program called Micrografx, I am new to PS myself but sorta carried over what I learned using Micrografx to using PS. Best of luck. Where's the download link? I'd like to try it out for my blog!